"In America's Defense Line, Grant Smith has penetrated once again into the murky waters that underlie the observable control of US Middle East policy by Israel and its aggressive American support base that have undermined the efforts of successive US administrations, be they Democrat or Republican, to resolve the Israel-Palestine conflict. In Foreign Agents and now in America's Defense Line, using recently declassified documents, Smith exposes the charade that the 'pro-Israel lobby' is simply a well-organized, overly zealous group functioning within the spirit of traditional American political advocacy. What we see is something far more sinister. America's Defense Line should be required reading for anyone concerned with preserving what is left of the US political process." Jeffrey Blankfort is the former editor of the Middle East Labor Bulletin and hosts the international affairs program "Takes on the World" on KZYX Pacifica Radio in Mendocino, California. "Grant Smith renders great service. The secret documents reviewed in this volume will help any reader understand how a small but determined group of zealots for Israel have placed the United States in grave danger. It is a wakeup call that must be answered, if our noble experiment in representative government, which has long proclaimed justice for all people in all lands everywhere, is to survive. I choose those words carefully. This is no time to sit on our hands. Unwarranted fear of Israel has plunged us into an abyss that gets deeper all the time. All that is needed is a civilized discussion, one that this volume must surely bring forth." Paul Findley, Member of Congress 1961-83, author of three books on the U.S.-Israeli relationship, including the Washington Post bestseller "They Dare to Speak Out: People and Institutions Confront Israel's Lobby"
"Grant F. Smith has taken on one of the most powerful lobbies in the United States and American politics. His writing and research has pointed to the great danger that the Israel lobby�in particular AIPAC�represents to American democracy. It is essential for any knowledgeable American to subscribe to the work of IRmep which Grant F. Smith leads. More important, buy this book on the Israel lobby's role in subverting American foreign policy." James Petras is a Bartle Professor (Emeritus) of Sociology at Binghamton University, New York. 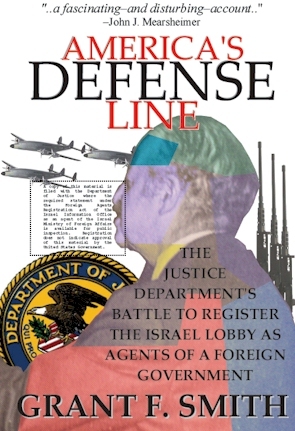 "This is an excellent book that brings together declassified material showing how the Israel lobby managed to sow corruption at the highest levels of the US government and even break US law. Like other excellent books by the author (e.g. Deadly Dogma and Foreign Agents), America's Defense Line breaks new ground in research into the destructive role of narrow special interests in US domestic and foreign affairs. This latest contribution is a tour de force and is a must read for anyone interested to understand why we are embroiled in the quagmire of the Middle East and how we might get out of it (thus saving our economy and our global reputation)." Dr. Mazin Qumsiyeh, Professor at Bethlehem University and author of "Sharing the Land of Canaan: Human Rights and the Israeli-Palestinian Struggle"
An unforeseen effect of the Iraq war is allowing more Americans to speak freely about the role of the Israel lobby. When and how was it born? While it is generally understood that American interest groups played a crucial role in the creation of the state of Israel in 1948 and supporting politicians who would stand up for Israel, other facts have remained elusive. Grant F. Smith reveals that many of the functions the Israel lobby smoothly and quietly executes in political life today were formed in the late 1950s and early 1960s: the crucial political contributions and unrelenting campaign to convince Americans that Israel and the United States share common interests and enemies, whether the old Communist bloc�or Islamic radicals in the 21st century. Smith documents the lobby's awesome resistance to public accountability for its actions from Congress and the Justice Department. That fascinating history is the terrain of this book. Referencing over 1,000 previously classified documents released under a Freedom of Information Act filing, Smith follows Isaiah L. Kenen's path from registered foreign agent for the Israeli government to founder of the American Israel Public Affairs Committee or AIPAC. Smith unearths a formerly secret non-prosecution agreement, the "subvention caveat" reached between the Israel lobby and the US Department of Justice. The agreement reveals a great deal about the operational latitude of the lobby and the US government's institutional aversion to challenging it. America's Defense Line may forever change the debate about US Middle East policy formulation.